KOLKATA: It all went according to script for Thailand’s Pariya Junhasavasdikul as he drove home the overnight two-shot advantage with an unwavering final round of one-under-71 to win the McLeod Russel Tour Championship 2016, PGTI’s year-ending event worth Rs. 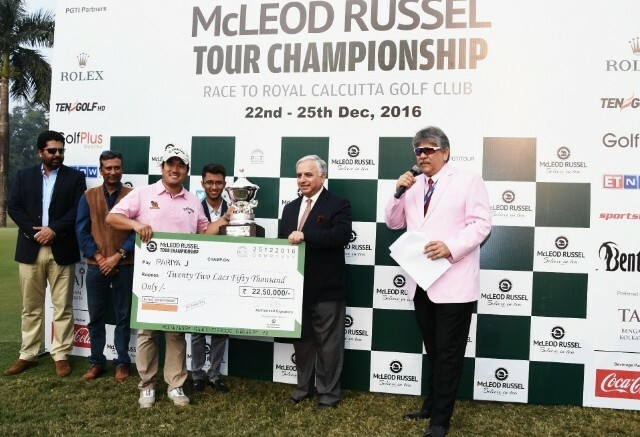 1.5 crore, by a comfortable three-shot margin at the Royal Calcutta Golf Club (RCGC) here on Sunday. Pariya, the wire-to-wire winner, who ended up with a tournament tally of 15-under-273, became the first foreign player to win the championship, which saw the culmination of the landmark 10th PGTI season. Pariya took home the winner’s cheque worth Rs. 22,50,000. Delhi’s Rashid Khan bagged his second Rolex Player of the Year title after finishing runner-up at 12-under-276. He had a sedate final round of even-par-72 at the season-ending event. Rashid took home the runners-up cheque of Rs. 15,00,000 and zoomed from fourth to number one in the 2016 Rolex Ranking with season’s earnings of Rs. 44,79,880. He had previously won the Rolex Ranking crown in 2013. Shamim Khan of Delhi matched the course record with his phenomenal last round of nine-under-63 to finish tied third along with Gaganjeet Bhullar and Kolkata’s SSP Chawrasia at 10-under-278. As a result of his outstanding 63, Shamim grabbed second place in the Rolex Ranking with earnings of Rs. 41,16,458. Patna-based rookie Aman Raj took a share of 10th place at four-under-284. He thus finished on top in the PGTI Emerging Player of the Year race with the highest earnings among the rookies (Rs. 10,34,427). Pariya (66-68-68-71), the overnight leader by two shots, was quick off the blocks as he birdied the first hole for the fourth successive day thanks to a 30-feet conversion. The two-time Asian Tour winner’s putter was on fire through the front-nine as he picked up two more strokes on the second and sixth, one from 20 feet and the other from 40 feet, to open up a mammoth seven-shot lead. The three bogeys thereafter which came at the expense of just one birdie courtesy some erratic tee shots couldn’t do any damage to Pariya’s prospects as all the others struggled to catch up with him. The 32-year-old finally signed off with a 71 after his chip on the final hole hit the flag stick in dramatic fashion and set up a two-foot par putt. Pariya, the first Thai player to win on the PGTI, said, “I again had a great start to the day with three birdies on the first six holes. That gave me a good cushion at the top. However, I was a little rusty and never really felt very comfortable despite the healthy lead. “When I saw the score on the back-nine, I realized that Gaganjeet was getting close. But I told myself to relax and play conservative golf as anyone who wanted to catch up with me would have to shoot a really low score. Fortunately no one went deep today. “This win is all the more special since it’s my first event on the PGTI and also my first in Kolkata and the RCGC. I was here just to enjoy myself and didn’t practice through the week. I didn’t step on the driving range and the putting green. The atmosphere was unbelievable here at RCGC as the crowd responded to my good shots throughout. “I’d like to thank McLeod Russel for their fantastic hospitality. I’d love to come back to India, especially Kolkata, to play more events. I’m now looking forward to my family vacation in northern Thailand,” added Pariya, who also holds a commercial pilot’s licence and is passionate about flying. Rashid Khan’s (70-64-70-72) title hopes were dashed early when he dropped two double-bogeys and a bogey on the first seven holes. However, he made a valiant comeback with five birdies thereafter that helped him secure the runner-up spot and the Rolex Player of the Year title. The 25-year-old, who had suffered some injuries midway through the year, capped his impressive season with two wins, three runner-up finishes and three other top-10s from just eight starts. He posted a top-10 in every event he played on the PGTI this year. Rashid, who was in second and two off the lead after round three, said, “This has to be counted as a better season for me than 2013 when I last won the Rolex Ranking. In 2013 I had played 17 events but this year I became no. 1 despite playing just eight events. I have to be proud of this effort. “I played fewer events on both the Asian Tour and the PGTI due to my wrist injury and also the injury suffered after a bike accident. But I made the most of my limited opportunities this year. I’ve regained a lot of confidence with the Rolex Ranking win. This will help me get my game back on track in the next Asian Tour season. Shamim Khan mastered the greens on Sunday as he chipped-in for birdie on the sixth and sank five birdie putts from a range of 25 to 45 feet during his round of nine-under-63 that equaled Rashid Khan, Arjun Atwal and Edwart Fraytt’s previous course record. It helped him claim tied third place at the event and second position in the money list. Gaganjeet Bhullar (69) and Kolkata’s SSP Chawrasia (71) also took a share of third place, five shots behind the winner. Jyoti Randhawa came in sixth at nine-under-279 after firing a top-class 66 in round four. Aman Raj (71) finished joint 10th at four-under-284 to win the Emerging Player of the Year title. He finished number one in earnings among the rookies ahead of Veer Ahlawat of Gurgaon who was leading the standings coming into this week. Ahlawat finished tied 42nd at the season-ender. Shubhankar Sharma, the money list leader coming into this event, posted a disappointing 76 in round four to also end up in tied 10th. He thus slipped in the Rolex Ranking from first to third. Shiv Kapur ended tied 15th at two-under-286 while Kolkata’s Rahil Gangjee and Bengaluru’s Chikkarangappa, last year’s McLeod Russel Tour Championship and Rolex Ranking winner, were both tied 23rd at one-over-289. Mukesh Kumar secured tied 26th at two-over-290 and Kolkata’s Arjun Atwal claimed tied 36th at six-over-294. Jeev Milkha Singh closed the week in 50th place at 11-over-299.